Download "FY2015. Select Your Retirement Plan"
7 Selecting the Right Plan to Fit Your Needs Need continuing survivor benefits for your beneficiary - Monthly survivor benefit for your beneficiary if you die in service with at least eight years of earned service and either have at least 15 years of total service credit or are at least age 60. portion or all of your account balance to purchase an annuity. You could also take a lump-sum distribution or periodic withdrawals depending on your unique circumstances. 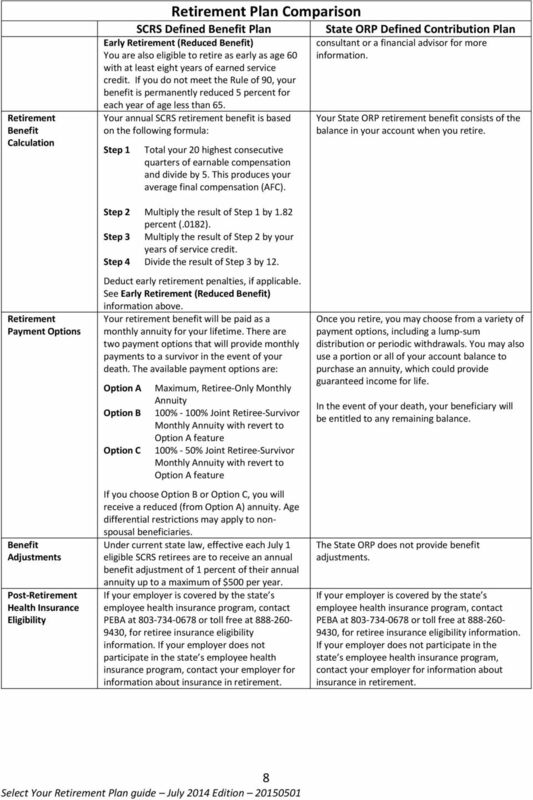 Plan Type Eligibility Employee Contributions Employer Contributions Refund before Retirement and Portability Retirement Plan Comparison SCRS Defined Benefit Plan SCRS is a 401(a) qualified governmental plan that provides a monthly annuity at retirement. The contributions made by you and your employer, and the investment earnings on those contributions are used to fund retirement benefits. Your retirement annuity is based on a formula that includes your service credit, your average final compensation, and a benefit multiplier of 1.82 percent. Your retirement income is not based on your account balance. 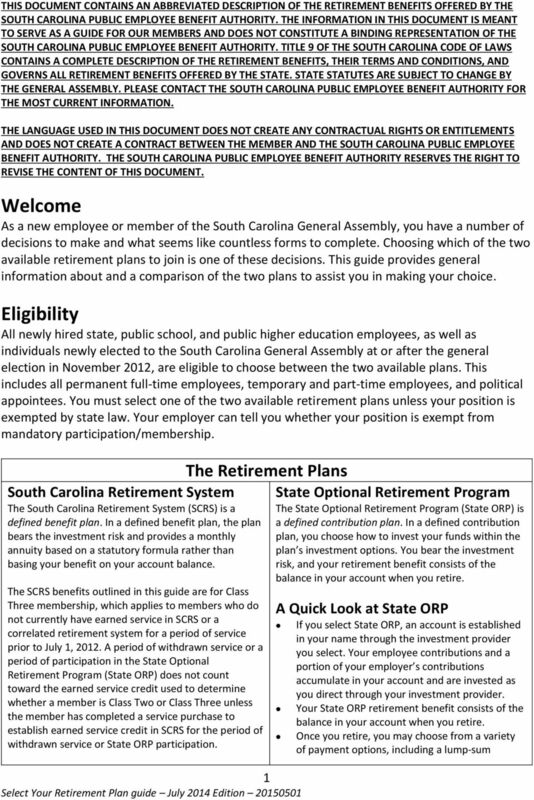 All public school employees, public higher education personnel, state employees, employees of other political subdivisions that participate in PEBA Retirement Benefits, and individuals newly elected to the South Carolina General Assembly at or after the general election in November 2012 are eligible for membership. This includes all permanent fulltime employees, temporary and part-time employees, and political appointees. Members of SCRS contribute a tax-deferred percentage of their gross pay to the System. These contributions are credited to a member account and accrue 4 percent interest annually for active accounts. The current employee contribution rate is 8.0 percent. The employee contribution will increase to 8.16 percent effective July 1, Your employer is required to remit a percentage of its covered payroll as an employer contribution to SCRS. These employer contributions are not credited to individual member accounts. If you terminate employment with at least eight years of earned service and leave your contributions plus interest in your SCRS account, you will be eligible to receive a deferred retirement benefit upon reaching retirement eligibility based upon your age or combination of age and years of service. If you terminate employment, you may request a refund of your employee contributions plus interest, but you forfeit your rights to any future retirement benefits. Employer contributions are not refunded. There is a 90- day waiting period from your termination date before a refund can be made. 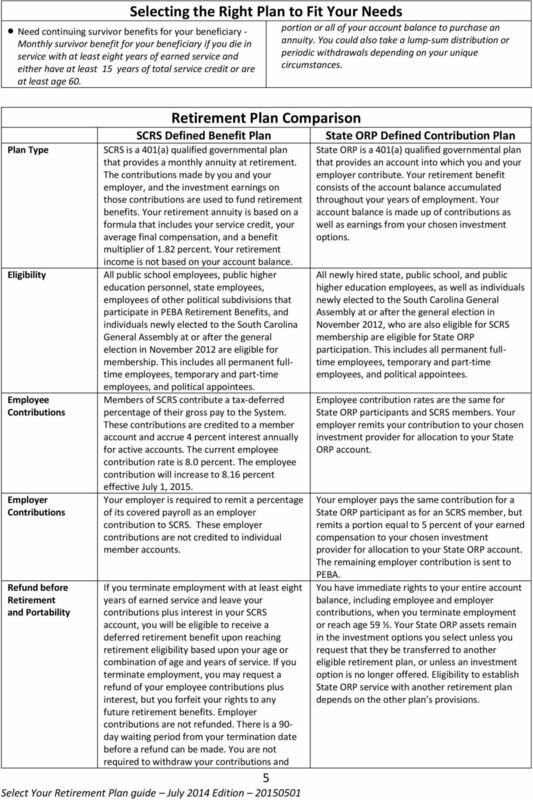 You are not required to withdraw your contributions and 5 State ORP Defined Contribution Plan State ORP is a 401(a) qualified governmental plan that provides an account into which you and your employer contribute. Your retirement benefit consists of the account balance accumulated throughout your years of employment. Your account balance is made up of contributions as well as earnings from your chosen investment options. 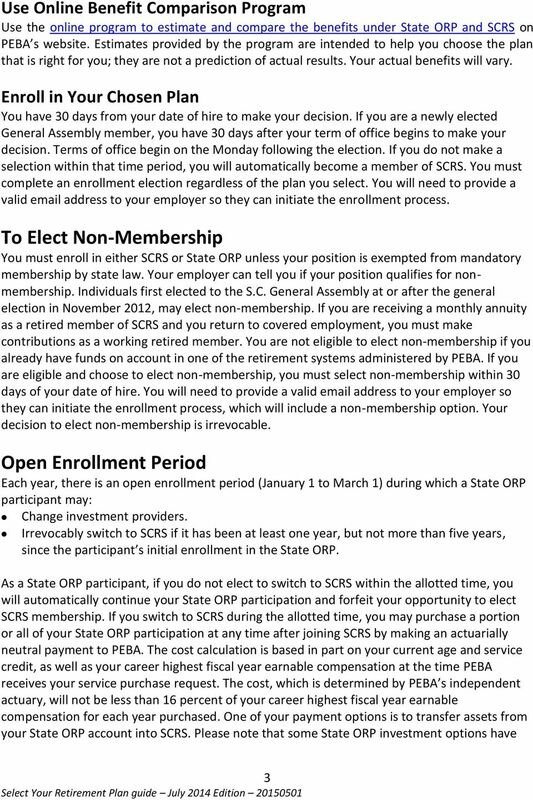 All newly hired state, public school, and public higher education employees, as well as individuals newly elected to the South Carolina General Assembly at or after the general election in November 2012, who are also eligible for SCRS membership are eligible for State ORP participation. This includes all permanent fulltime employees, temporary and part-time employees, and political appointees. Employee contribution rates are the same for State ORP participants and SCRS members. Your employer remits your contribution to your chosen investment provider for allocation to your State ORP account. 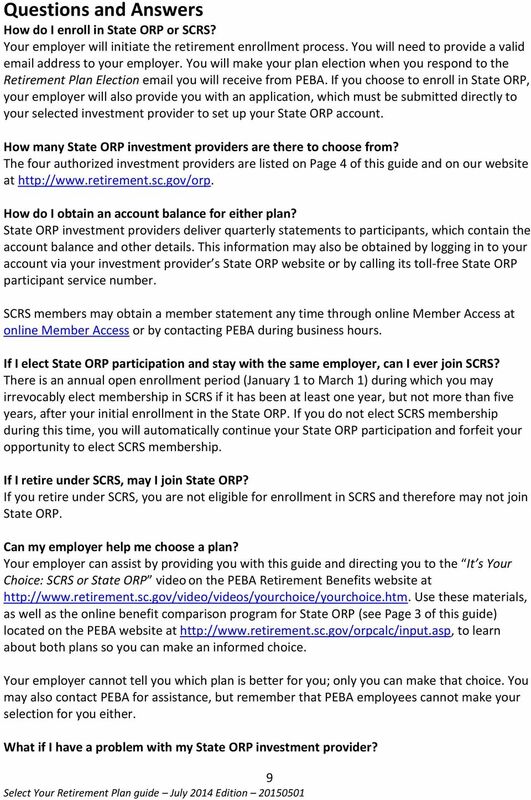 Your employer pays the same contribution for a State ORP participant as for an SCRS member, but remits a portion equal to 5 percent of your earned compensation to your chosen investment provider for allocation to your State ORP account. The remaining employer contribution is sent to PEBA. You have immediate rights to your entire account balance, including employee and employer contributions, when you terminate employment or reach age 59 ½. 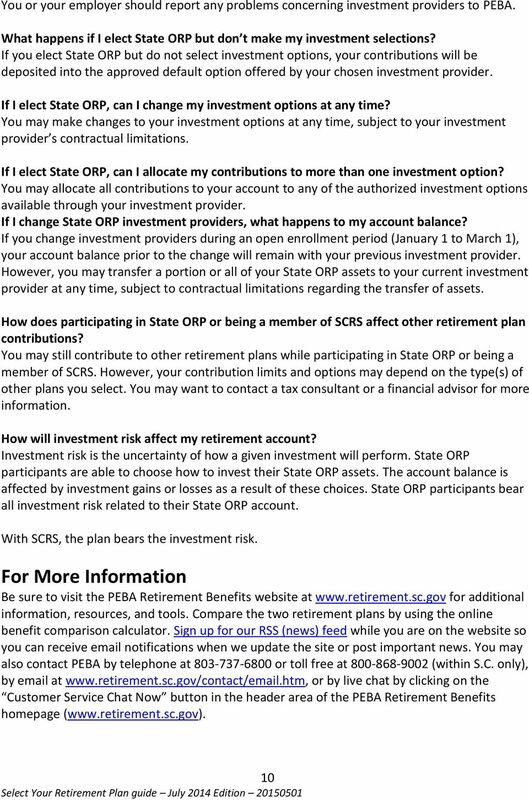 Your State ORP assets remain in the investment options you select unless you request that they be transferred to another eligible retirement plan, or unless an investment option is no longer offered. 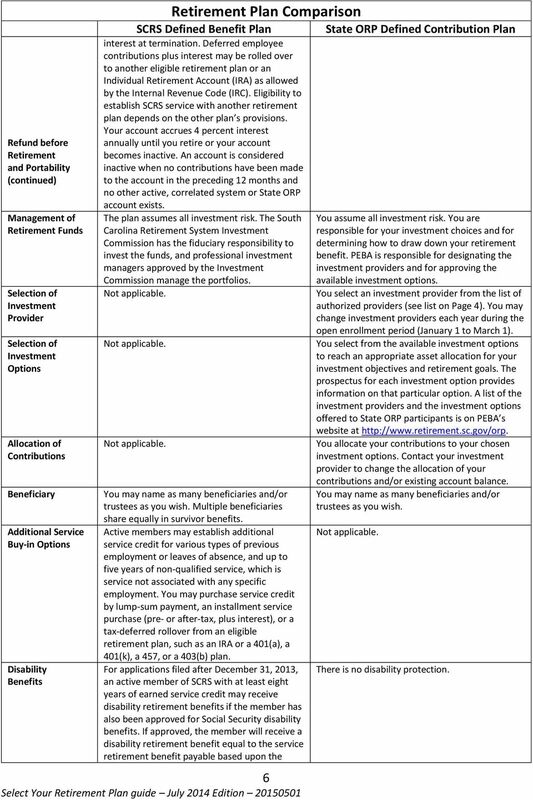 Eligibility to establish State ORP service with another retirement plan depends on the other plan s provisions. 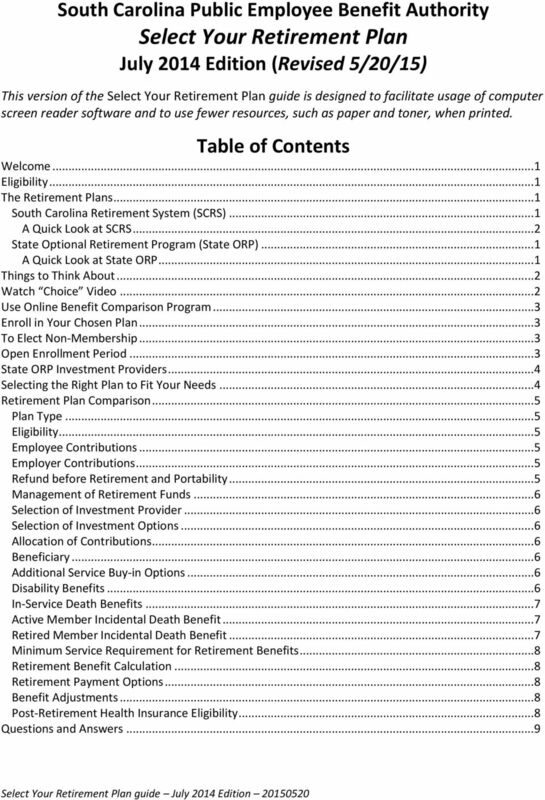 8 Refund before Retirement and Portability (continued) Management of Retirement Funds Selection of Investment Provider Selection of Investment Options Allocation of Contributions Beneficiary Additional Service Buy-in Options Disability Benefits Retirement Plan Comparison SCRS Defined Benefit Plan interest at termination. Deferred employee contributions plus interest may be rolled over to another eligible retirement plan or an Individual Retirement Account (IRA) as allowed by the Internal Revenue Code (IRC). 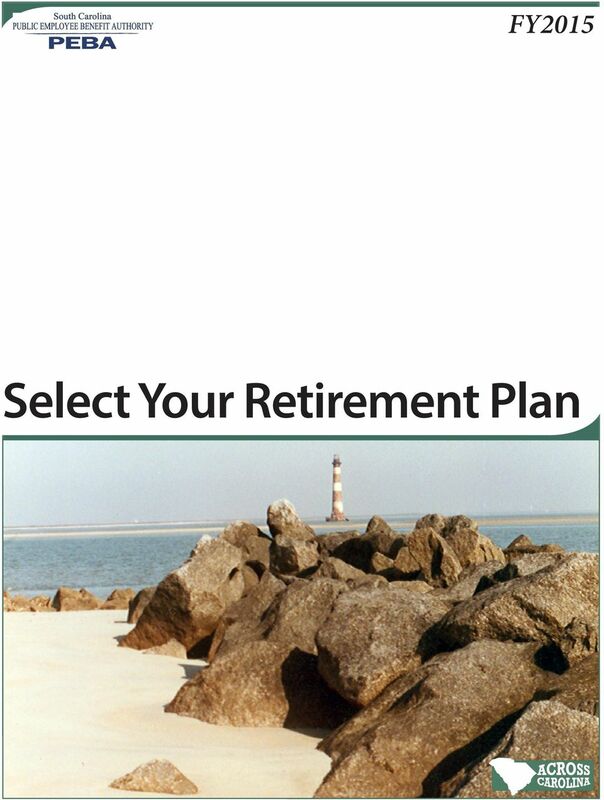 Eligibility to establish SCRS service with another retirement plan depends on the other plan s provisions. Your account accrues 4 percent interest annually until you retire or your account becomes inactive. 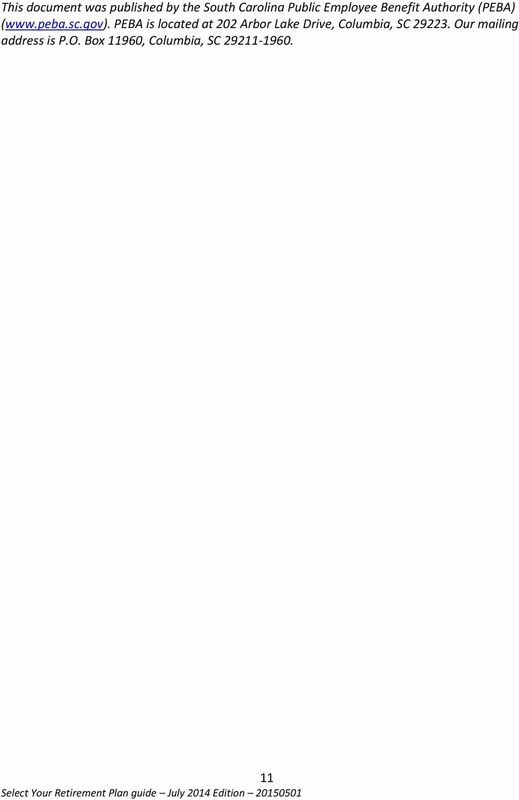 An account is considered inactive when no contributions have been made to the account in the preceding 12 months and no other active, correlated system or State ORP account exists. The plan assumes all investment risk. 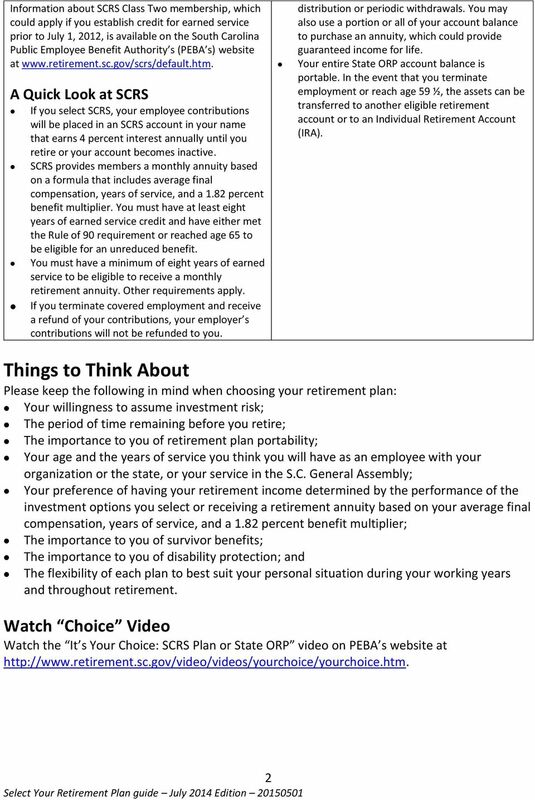 The South Carolina Retirement System Investment Commission has the fiduciary responsibility to invest the funds, and professional investment managers approved by the Investment Commission manage the portfolios. Not applicable. Not applicable. Not applicable. You may name as many beneficiaries and/or trustees as you wish. Multiple beneficiaries share equally in survivor benefits. Active members may establish additional service credit for various types of previous employment or leaves of absence, and up to five years of non-qualified service, which is service not associated with any specific employment. You may purchase service credit by lump-sum payment, an installment service purchase (pre- or after-tax, plus interest), or a tax-deferred rollover from an eligible retirement plan, such as an IRA or a 401(a), a 401(k), a 457, or a 403(b) plan. 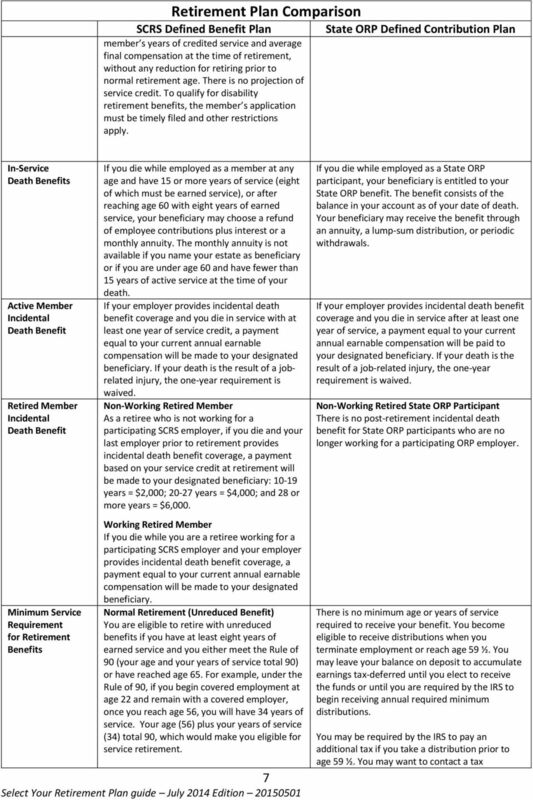 For applications filed after December 31, 2013, an active member of SCRS with at least eight years of earned service credit may receive disability retirement benefits if the member has also been approved for Social Security disability benefits. If approved, the member will receive a disability retirement benefit equal to the service retirement benefit payable based upon the 6 State ORP Defined Contribution Plan You assume all investment risk. You are responsible for your investment choices and for determining how to draw down your retirement benefit. PEBA is responsible for designating the investment providers and for approving the available investment options. You select an investment provider from the list of authorized providers (see list on Page 4). You may change investment providers each year during the open enrollment period (January 1 to March 1). You select from the available investment options to reach an appropriate asset allocation for your investment objectives and retirement goals. The prospectus for each investment option provides information on that particular option. 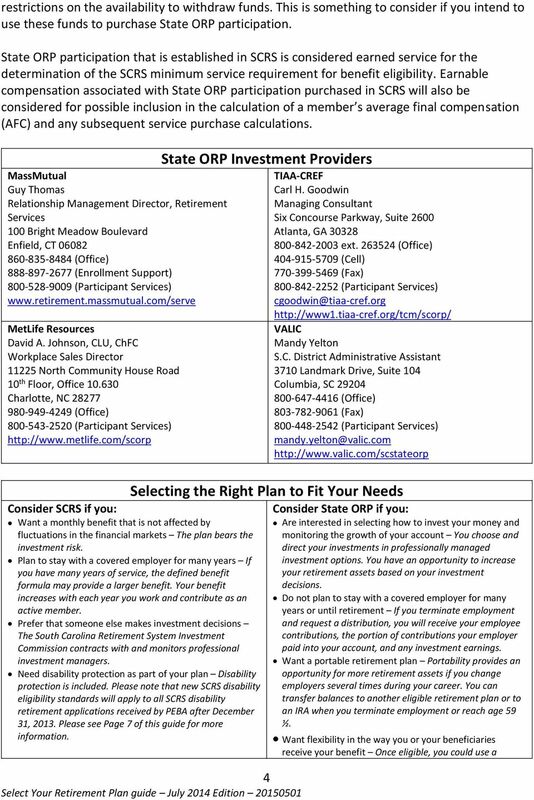 A list of the investment providers and the investment options offered to State ORP participants is on PEBA s website at You allocate your contributions to your chosen investment options. Contact your investment provider to change the allocation of your contributions and/or existing account balance. You may name as many beneficiaries and/or trustees as you wish. Not applicable. There is no disability protection. 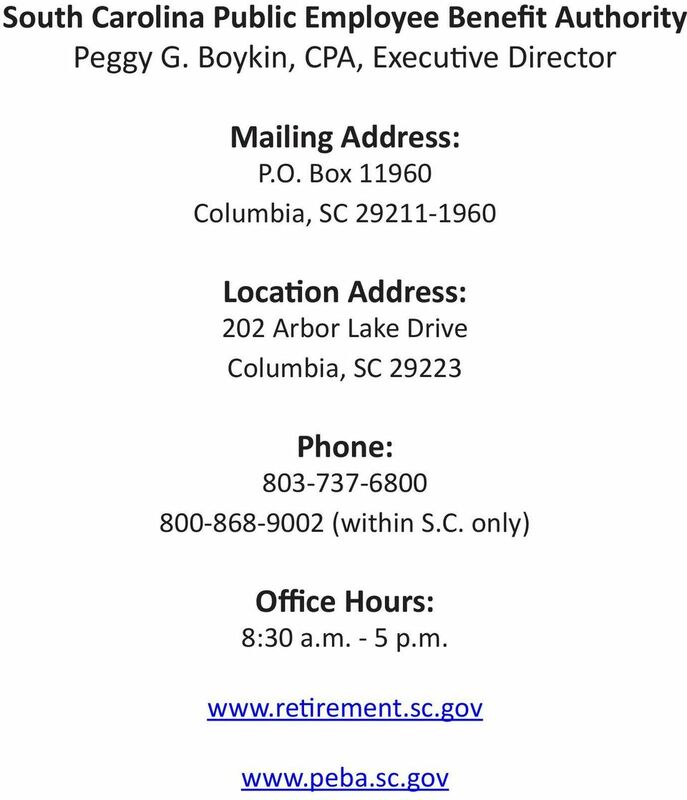 14 South Carolina Public Employee Benefit Authority Peggy G. Boykin, CPA, Executive Director Mailing Address: P.O. Box Columbia, SC Location Address: 202 Arbor Lake Drive Columbia, SC Phone: (within S.C. only) Office Hours: 8:30 a.m. - 5 p.m.
Teachers Retirement System of Georgia member s guide Welcome to the Teachers Retirement System of Georgia The Teachers Retirement System of Georgia (TRS) is pleased to provide you with this Member s Guide. Looking down the road. Choose your retirement plan in three steps.